Twist and go/moped – system like a motorbike where the power is applied via a handlebar or lever control. Pedal assist – system where the power is only applied so long as the pedals are turned. Hybrid control – has option to use elements of both power control systems. Step through – no or low crossbar making getting on/off easier. Folder – has features to make storage or carrying easier than with standard frame. 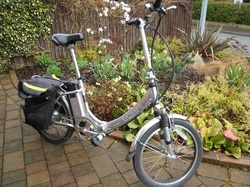 Pros: medium energy density, maintenance free, tried and tested on electric bikes, cheap. Cons: heavy, battery cells can age quickly and die, no fast charge option. Pros: medium energy density, fast charge the norm, medium weight, serviceable. Cons: Need interval discharges and servicing, suffer from memory effect, performance radically reduced in cold weather. Lithium-ion (Li-ion) 'is the latest technology' Pros: Very lightweight, very high energy density, durable, no maintenance, fast charge, can be stored. Cons: Expensive, can be unstable, cells charge and discharge at different rates. Finally, so long as the bikes meet Euro regulations, which basically means limited to 15mph with power applied, you do not need a licence or insurance to ride one. A 20 inch wheel step through folder with pedal assist power system with 3 three levels of assistance, range 25 miles plus depending on level of pedalling assistance and how hilly. Sixteen speed derailleur type gears, mudguards, stand, carrier and lighting all included. Mains charger and Li-ion battery pack. Battery under rear rack and motor in front wheel hub. Pros – can be ridden easily without power but with a choice of assistance to suit the terrain. Folded it can be carried in a suitable bag, not supplied. Cons - weighs about 23kg but folding is not easy and is best carried out by two people. The range of gears is too great with the lower 8 gears never used. Expensive at around £1200, but check latest prices. 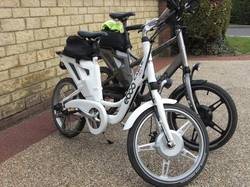 More information about these bikes from PowaRider Woking Surrey 01483 801026 or www.powarider.com. The club member with this bike is Eric Gould. Also a twenty inch wheel with a short wheelbase give it a sporty appearance, with a one size aluminium frame, cast alloy wheels incorporating motor, disc brakes and dynamo power lighting. There is a large range of adjustment and the bar stem rakes back and forth at the touch of a button. There are three levels of power, plus a turbo button. When the rider pedals power kicks in. Big tyres and a small amount of front suspension ease out the bumps. Shimano eight speed derailleur gears and a sensing system means that the more you pedal the more power you get. Weight is about 25 Kg, the battery is 36V 10 Ah Li-Polymer, Charger DC36V 2.0A, Range approx 50 miles but varies with weight and terrain. Reads Km on speed meter, trip and total distance. Max power support 25 Km/hour. A popular bike with the Laika Club members, usually the 20” wheel model, although a 26” wheel model is available. A simple twist grip throttle with a selector button for either; a –No electric assistance, b- pedal detecting assistance, or c, - pure twist grip control which is recommended for greater range as it is fully controlled by the rider. There is just one power option, ie no power boost facility, but it still provides excellent performance. The 36volt battery, 10 amp hour supply, powers a 250 watt motor and will allow 20 – 35 miles range depending upon hills, rider ability etc. Cons – can’t think of any!! !